A little over a year since adopting Santina from me, Lori came to NYC to visit. Lori and my wife Marianna have become good friends and wanted to go sightseeing around NYC and doing bird stuff. They played with our birds, visited bird stores, and did some rescue fund raising in the city. Santina was in good hands with Lori's friend while she went away. Lori had been preparing Santina and her friend almost since the beginning for some eventual absence. Lori did not know how, when, or why she might not be around to take care of Santina but she knew that the possibility can always exist (even if not deliberate, say an emergency). So, when a trip to visit us in NYC came up, Santina and her birdsitter were already prepared. 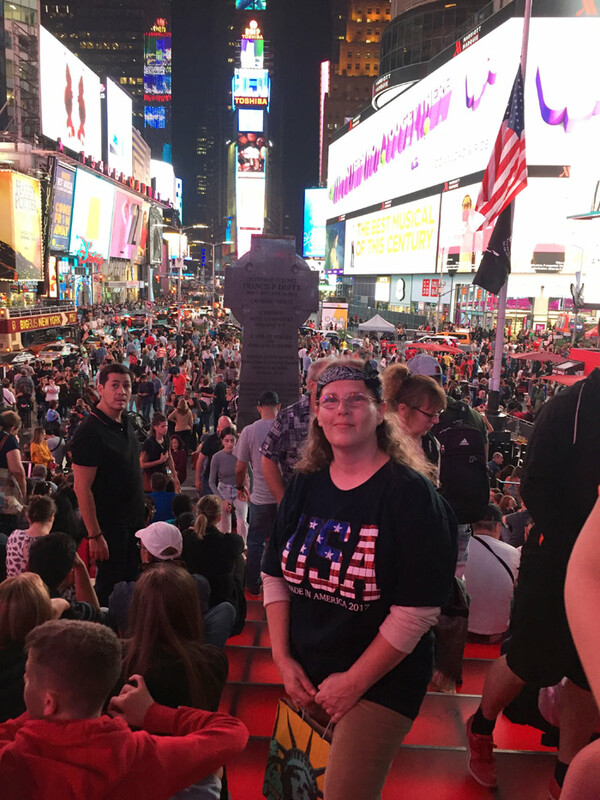 Marianna took Lori to the Statue of Liberty, Times Square, Central Park, and all around New York City. They also spent a long time seeing birds at the Todd Marcus Exotic Bird Store, and a few others. Lori enjoyed getting to spend time with Kili, Truman, and Rachel as well. 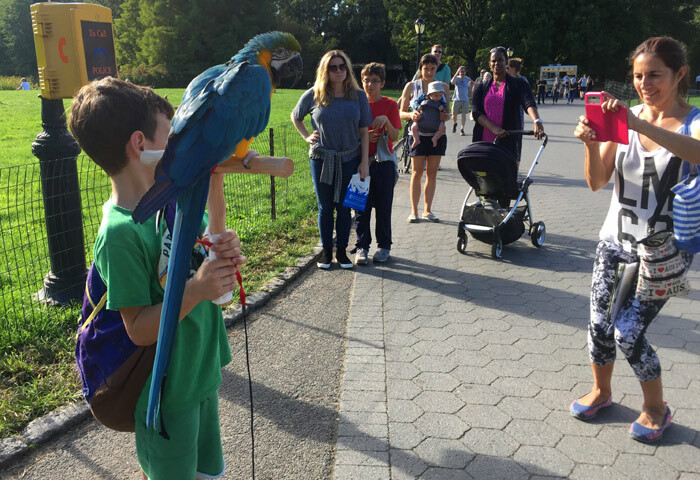 Lori and Marianna spent a day in Central Park offering pictures with the blue and gold macaw Rachel to raise money for Ginger's Parrots Rescue. They raised $150 for the rescue. 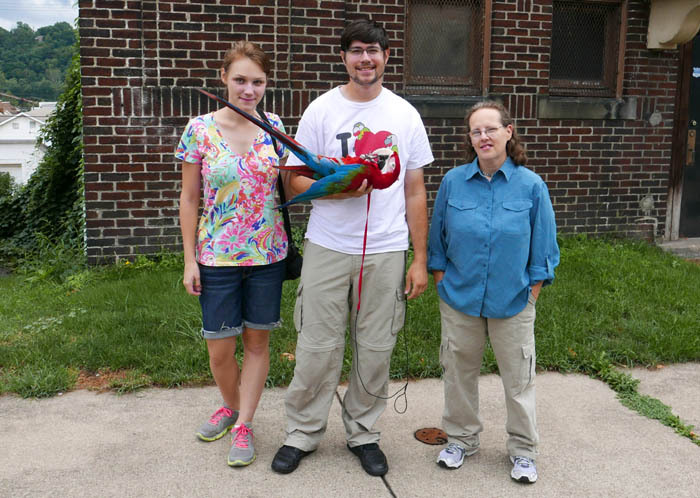 Not only that, Rachael got some much needed socialization and helped educate the public about parrots. Then came the visit to Santina. We flew Lori back to Pittsburgh in my airplane and stayed the night to spend some time with Santina. The last time I had seen Santina was Christmas of 2016. It has been over a year since her adoption and 10 months since I had last seen her. I was not sure if Santina would still remember me or be alright with me handling her. To be on the safe side, I took my time getting to know her again like meeting a new parrot. I did not barge into the room and just demand she step up. Instead, I let Lori handle her a bit first and then I just gave her a nut. Santina took the nut just fine so I offered her to walk over and step on my arm. She came over just fine and put herself on my arm and got a nut. Santina was lovey dovey in no time. However, if I just assumed that she would remember me and things would be fine, it could have overwhelmed her and led to trouble. It's always best to err on the side of caution and give the bird time to adjust. Lori put Santina's harness on so we could go outside. This was pretty effortless since Santina was carefully trained to wear the harness and Lori continued using the same method. We walked around her town a bit with Santina and even passed her back and forth between us. I'm really happy to see Santina in such good hands and to see how much joy Santina brings to Lori as well. A year ago today, I married the love of my life. As we celebrate our one year wedding anniversary, I would now like to share with you memories of that special day. Sorry that I didn't have a chance to post about the wedding sooner. Right after the wedding we left for three weeks to Australia on honeymoon. Then when we got back we had a lot to catch up on and married life to adjust to. 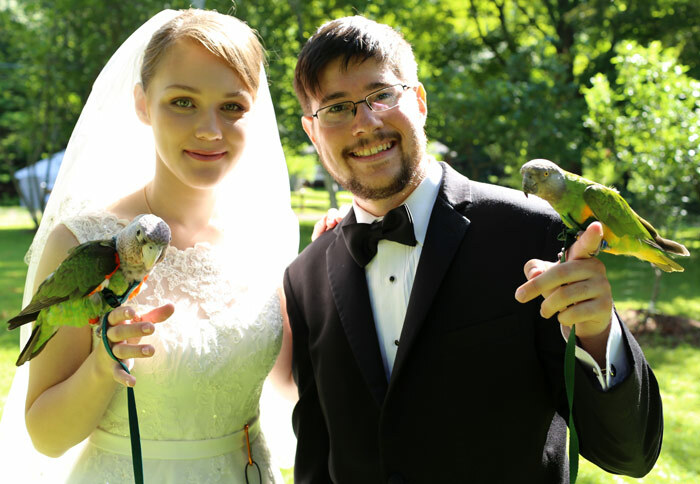 I spent a lot of time editing together footage of Australia parrots so that set me even further behind on getting to the wedding footage. By the time I had a chance to work on the wedding video, it was the harsh middle of winter. I was just posting pictures of parrots and snow. Posting footage of a summer wedding would just be out of place that time of year. So we decided it would be best to wait till August and share with you the wedding on the same day, one year later. The quick version of how I met my bride: Truman, that little flying monkey, got lost in New York City. I received help searching for Truman from a random stranger. Him and I started the New York City Parrot Adventures Group and hung out in Coney Island with our parrots. 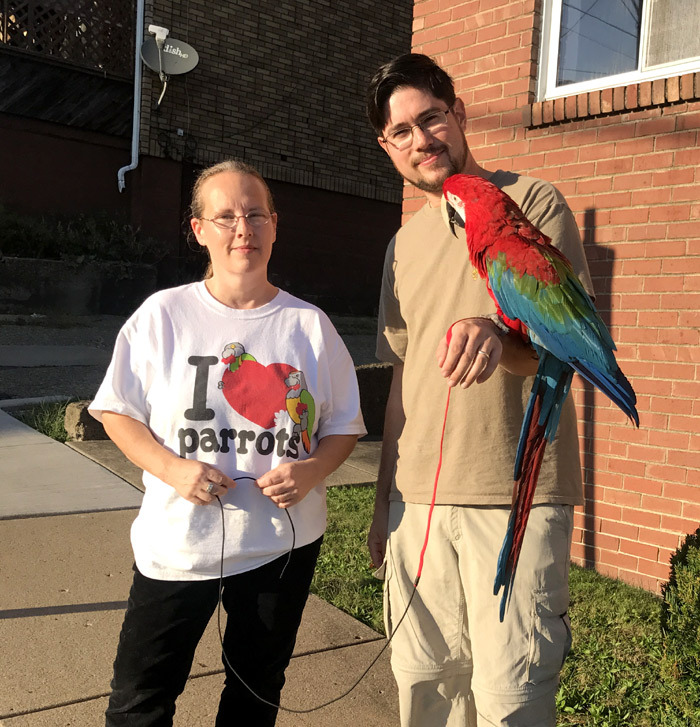 Marianna, who already had a Blue and Gold Macaw, learned of these outings through my youtube channel. She joined the group and started coming to our parrot outings. She fell in love with Truman, and I with her, and she with me. Long story short, we ended up getting married. Full story of how we met is here. Fast forward to August 8, 2015. It was a cool summer morning in northern New Jersey. Crickets were chirping and songbirds singing. A thin layer of fog formed on the lake that would serve as the backdrop for the wedding ceremony. A few of us spent the night at the lakehouse for an early start. But the majority of guests (and the birds) began arriving in the later part of the morning. Our bird friends Ginger and Kristine were responsible for bringing all of the parrots from our house that day. Once our parrots arrived, we went out to take some pictures. We continued taking photos with family and friends until the ceremony which started at noon. Kili and Truman not only were the ring bearers but they were also the wedding party. 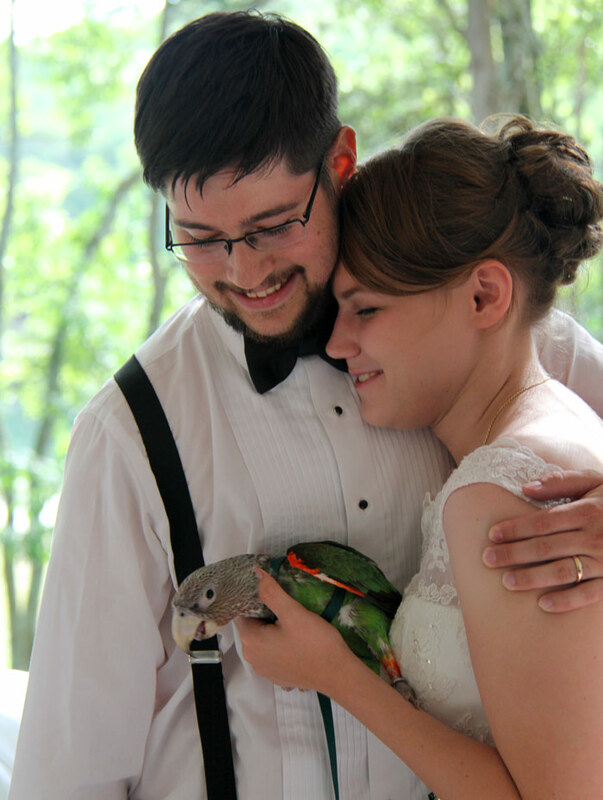 Kili was the best bird and Truman was the bird of honor. It is understandable that Kili would not allow to be any bird but the best. 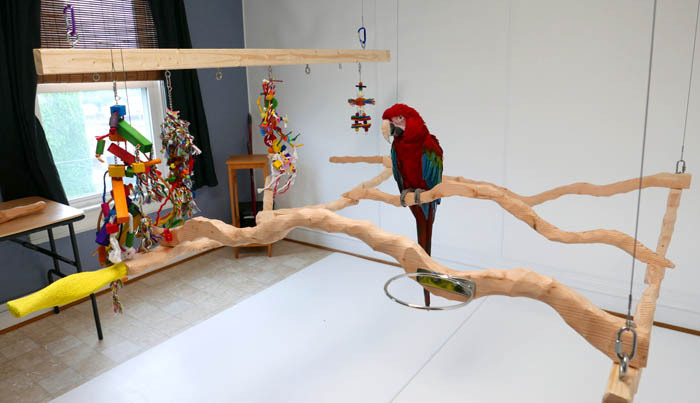 Rachel and Santina, the big macaws, were placed on specially decorated Training Perches at the sides. 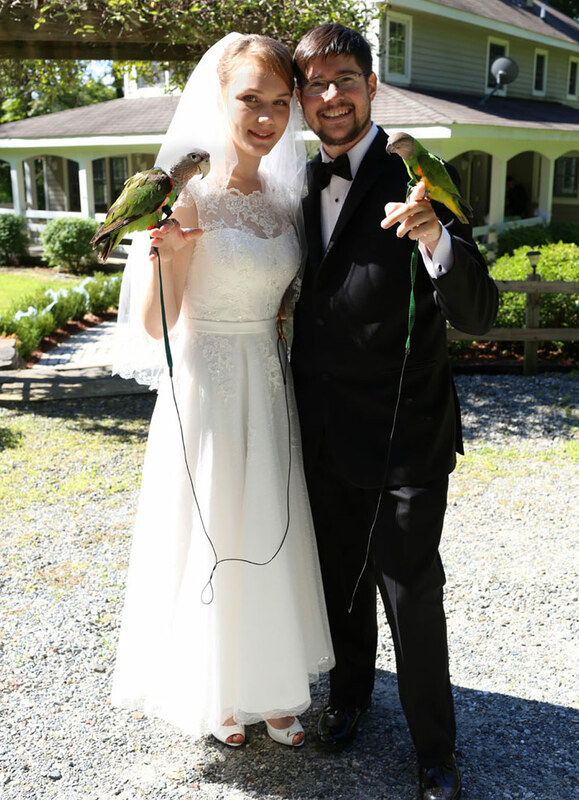 At the lead of the bridal processional, Kristine and Ginger brought out the wedding party parrots. Then came the bride with her father. 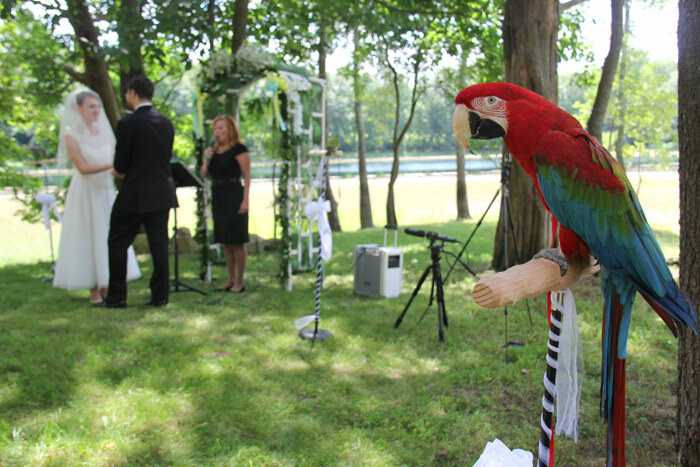 The ceremony was held on a shady peninsula that stretches into the lake. The ceremony went much like any other with the "I dos" and promises of eternity. Kili and Truman helped provide the rings. At the ceremony's end, we had a video drone fly over to get aerial footage of the wedding ceremony. The birds welcomed the robotic whirlybird. It was no surprise to Truman as he had been exposed to flying drones before. We had a tent erected over the deck for the reception. It provided cool shade in the August sun while everyone sat at one very long table. Bacon wrapped scallops, ginger lamb bites, and steak were catered to everyone's delight. For desert, guests dipped fresh fruit and marshmallows in a chocolate fountain. 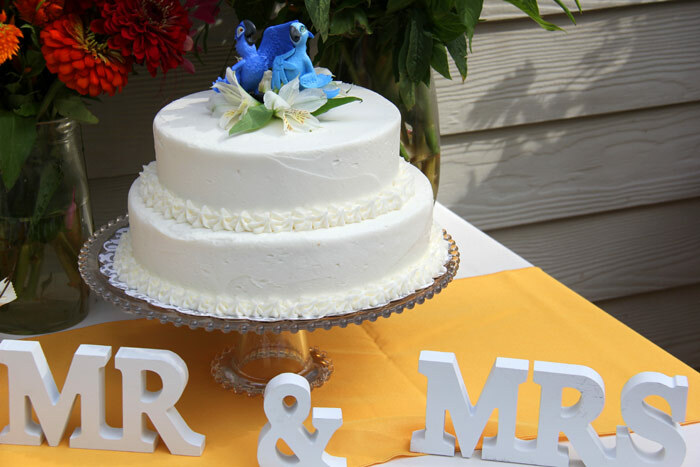 Blue and Jewel from the movie Rio, topped the wedding cake. 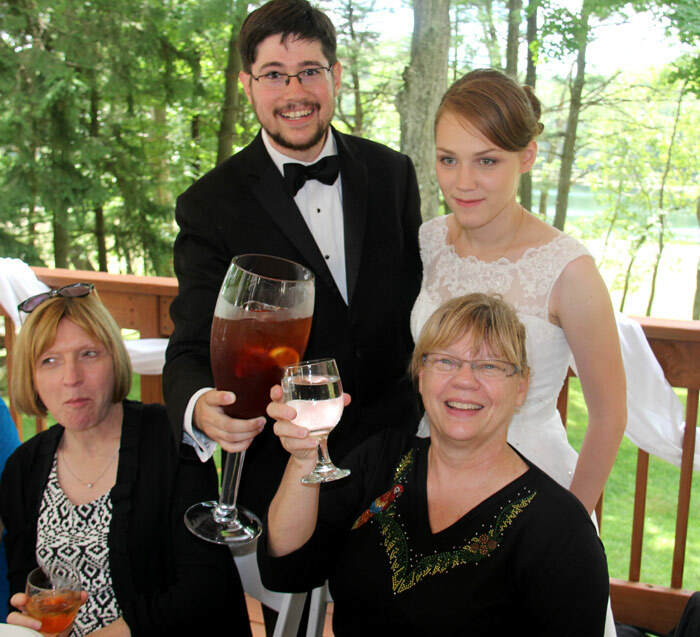 Marianna received Truman as a wedding gift. It was his calling all along. His purpose was to make a special someone in my life happy. And like wine, with age he gets better. When he was young, he was pretty difficult. Going through his terrible twos (and more like terrible twos, threes, and fours), he was a menace. But with those years behind him and lots of training, Truman is as good a pet as ever. 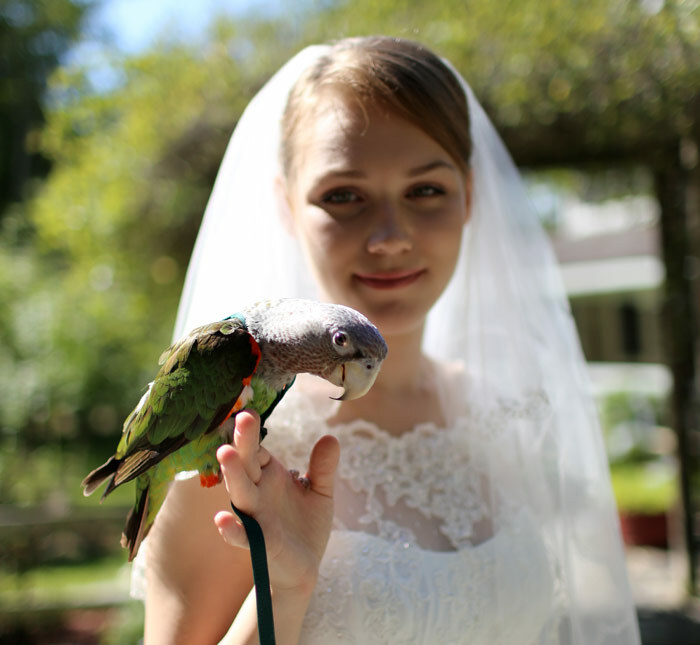 Marianna was ecstatic to receive this feathered monkey of joy on her wedding day. After the reception, my bride and I boarded a white stretch limo. It took the long scenic route to the airport while many of the guests took a shortcut to get there sooner. The limo arrived to the airport and drove across the runway. Our guests greeted us at my decorated airplane. We took some pictures and then transferred from our limo ride to the airplane. The guests waved goodbye as the newly married Mr. and Mrs. Sazhin flew off into the sunset. Dreams do come true! Aviator Harness with a Handicap? 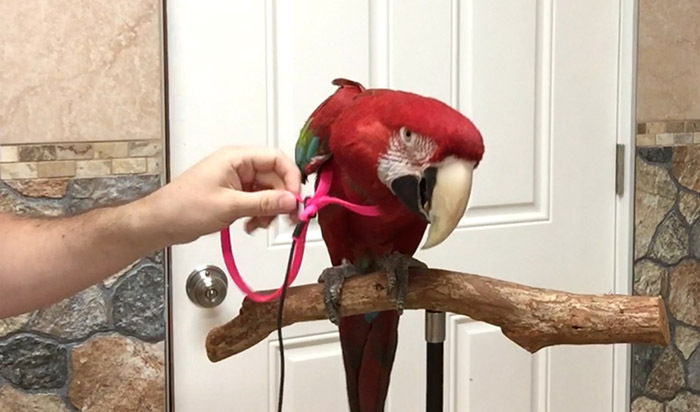 I received a question from a follower about whether or not it is possible for someone with a handicap/disability to put an Aviator Harness on a parrot with just one hand. I was about to just say the first thing that came to mind, "no!" But I had no experience with this either way so instead I said that I would look into it. After all, who better to try it out and find out? I realize that there are many people with disabilities that keep parrots. Some are in a wheelchair or have shaky hands from PTSD. Others have trouble just from age while some are young and dealing with a temporary injury. 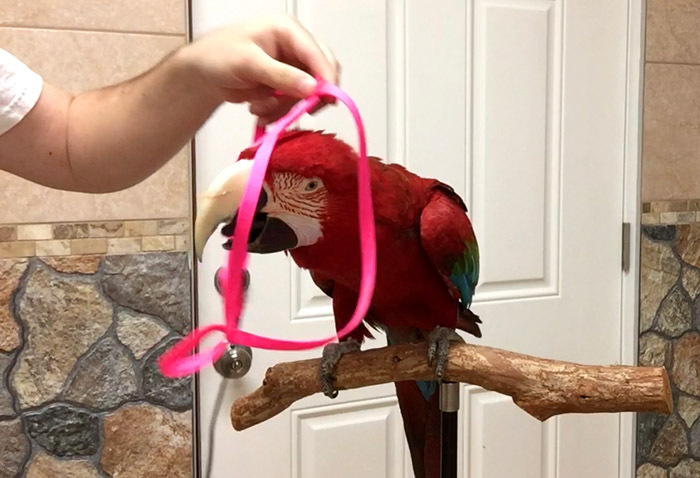 So although the video included here is based on one single type of disability, I would like to use this as an encouragement for any physically challenged owner that there are ways to succeed in training your parrot despite your impairment. 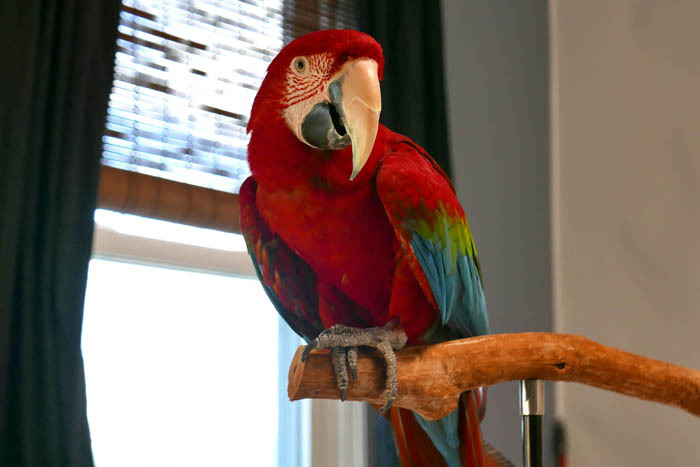 Note that although this article is about one specific type of impairment and about one kind of training example, the mindset conveyed here may be helpful for all sorts of parrot issues and for any person having trouble with their parrot. 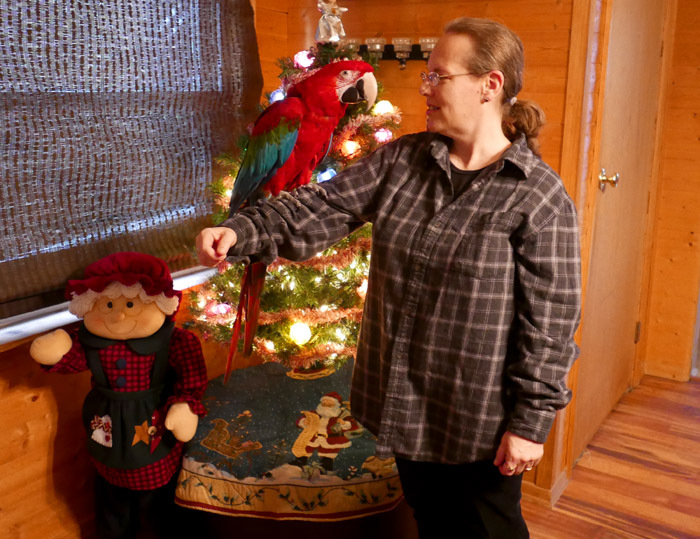 Granted Santina is fully harness trained already, this experiment was solely about whether or not it is even possible to consider harnessing a parrot with the use of just one hand. Well, I am happy to say that I learned that it is. Santina had not even worn a harness since last year and yet she was cooperative at putting it on. This is largely due to the fact that she was taught to wear the harness using positive reinforcement from the start and looks forward to it whenever she sees it. Since the harness was never forced on her, she has no reason to freak out when she sees it for the first time in a while. I did just one normal run with the harness to make sure she was still ok with it. So I dangled the harness in front of Santina and she just stuck her head straight into the collar the way she was taught. Getting the collar onto the bird myself with one hand would have been much harder and simply impossible if the bird resisted. But since she actually wants to get it on, her assistance made it substantially easier! Pulling the straps through and around the wings was only more time consuming but no harder than usual. The hardest part I found was to pull all the extra material through the bird-proof clasp with one hand! Without the ability to hold the clasp in one hand and feed the material through with the other, it was a challenge of dexterity to do it with my fingers. But with practice it got better and by the second take, I kind of had it down. I would recommend anyone with a disability working with the harness, or any kind of training, practice all the mechanics of it ahead of time to reduce strain on the bird. Besides a few nuts, Santina got to go outside for the first time this season, a reminder of how wonderful it is to wear a harness and go out. I didn't pester her further with my own clumsiness to take it off with one hand because she was eager to get back to her normal bird business when we returned. However, I am sure that the exact same process could be repeated in reverse. My conclusion is that if you can tie your shoe laces with one hand and go about daily tasks, putting an Aviator Harness on a parrot with one hand is at least possible! The key part is the training. More precisely than ever, the bird with the impaired owner requires the most accurate of training. Yes, the parrot can be taught to fill some of the role of the owner and help in the harnessing process! But the training must be correct and thorough. More patience, self discipline, and attention will be required. But if your goal is to beat your impairment and achieve the same things with your parrot, then I think it can be done! 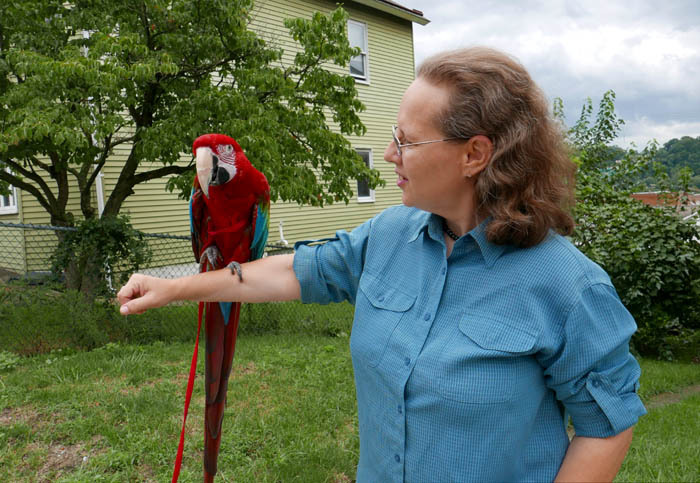 Sometimes I find myself impaired during parrot training even with two hands. Some things I do with the birds makes me wish I had three or four hands to accomplish all the training at the same time. But since that won't be happening, I have to make do with what I have. I find ways to either break behaviors down into smaller portions, devise tools to help me do more within my capabilities, or worst case scenario, I seek help from someone else to get more hands into the training scenario. No reason the same can't be done going from two hands to one, or working from a wheelchair, or dealing with a different impediment. I suggest that anyone planning on having their parrot wear a harness to safely go outside, follow the steps covered in my Harness Training DVD. Further, it is important that the bird be prepared to begin this advanced training by performing the requisite basic training explained in my book. There is an automatic special discount built in on my online store. If you order a Book + DVD or Harness + DVD, DVD is 50% off. Book + Harness and the DVD is free. What I found interesting was how not-unusual the challenge was! Although it was challenging, it was challenging the same way that any parrot training task is. There is a goal to accomplish x and y with the parrot with limited means and communication. So I work on solving the puzzle through trial and error, positive reinforcement, reading body language, and all the usual tools used to train behavior to the birds. 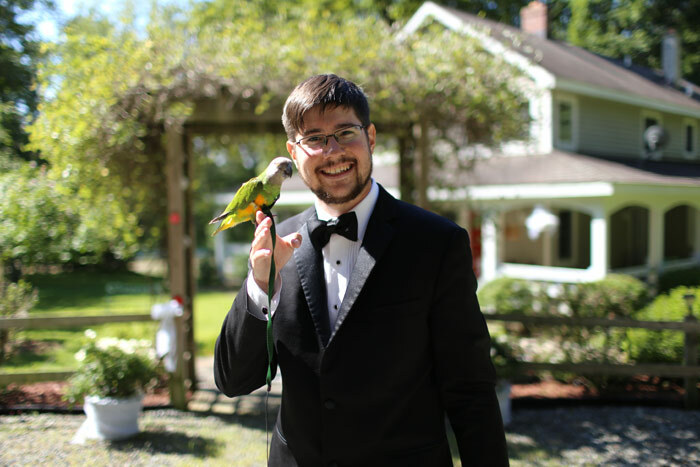 What I discovered was that harnessing a parrot with one hand is really the exact same thing just with the added step of using less appendages and more patience. This turned out to only be one step more complicated than harness training a parrot in the first place. There are loads of other challenges in getting a parrot to wear a harness so this is just an extension of that and just adds one more challenge and nothing more. The same problem solving mindset that needs to applied to teaching the bird to wear a harness in the first place can just as well help overcome the added physical demands. This system for overcoming disability and accomplishing things with our parrots stems far beyond just harness training. Target training, trick training, taming, flight training, and all that good stuff can be achieved through patient persistent application of the training methods that I teach. I'm not saying it will be easy. You will have to tailor these methods to your specific conditions. But following this system, you will find success with your bird.